There are many songs to sing in praise of The One Ring RPG, among them ones of its art and overall design, which conjure up a fairy-story feeling both rich and flavourful. While I do find that in particular the creature design crosses over into long crook-nosed orcs and the like, it is on the whole at the very upper reaches of what anyone would expect from roleplaying games. One thing I've had an issue with since the beginning however, was the map which shipped with the game. While it is certainly servicable, and not exactly terrible as such, I do as a matter of personal taste, find it to be cartoony to the extent where it's almost distracting. Maps are so important to Middle-earth, not only because Bilbo happened to love them, but because it is filled with such an expressful geography, which is the foundation upon which the stories themselves take place, more so than perhaps any other RPG I can think of. And I knew as soon as I had found The One Ring, as I went about getting a group together to play it, that making the lands spring to life would be one of the pillars upon which the game would rest. If for nothing else, because travel plays such a large part in the adventures over the edge of the wild, but also because our games would by necessity be long-distance, played over Roll20, and much of the time would be spent staring at the monitor. Something would have to be put on that monitor. Long story short, I looked around for a replacement map which would help us more fully imagine Middle-earth, and came upon Peter Fenlon's fantastic map of Western Middle-earth, published by I.C.E. for the Middle-earth RolePlaying Game (MERP). Several things won me over immediately. 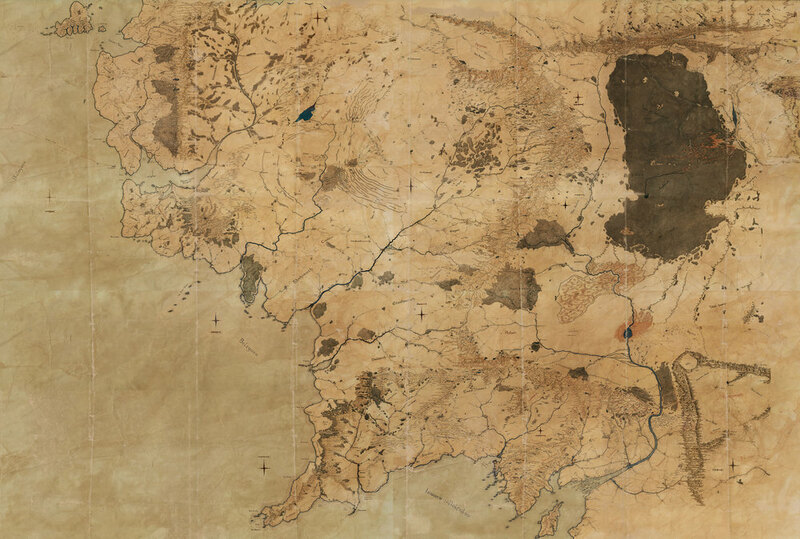 First of all it's a stunning map; more detailed than any other Middle-earth map I've seen. Secondly it was available at a, while not perfect, nevertheless very reasonable resolution (I would love to have a larger version, call me). 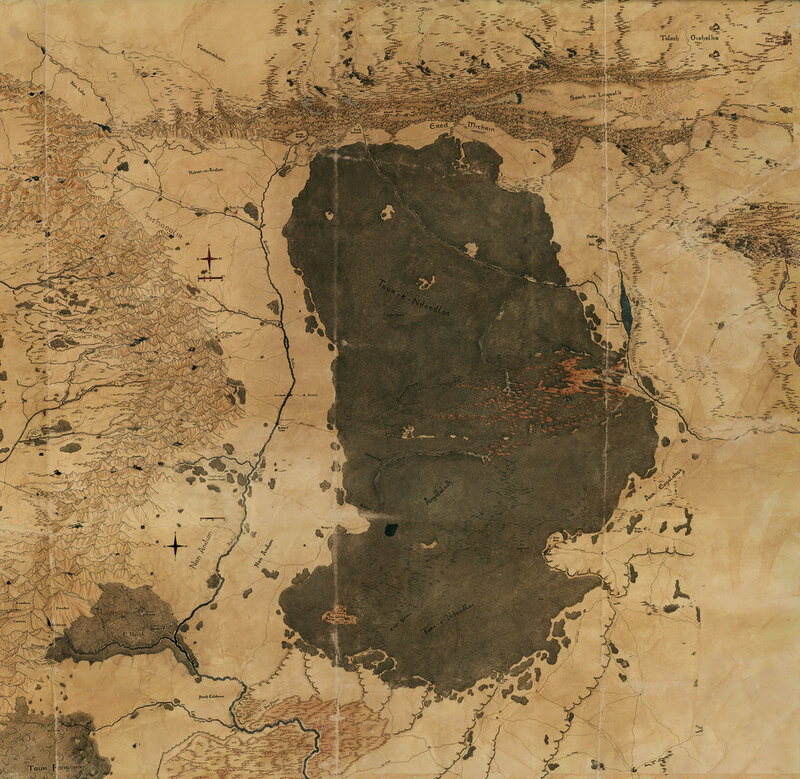 And thirdly while it indulges in detail, it put all of the major locations and geographical features in the same place as the game's original map (whereas Karen Wynn Fonstad's maps are at odds with the position of for instance Rhosgobel). And finally, it covers a vast expanse of Western Middle-earth, so when the company decided to ride to Gondor, they can. It's also no longer in print. I aged it considerably, as the original print colors weren't quite to my liking, and because if there's one thing that screams fantasy roleplaying, it's aged maps. So there. I also removed some hand-writing and added a few minor labels, as all the labels in it are en elvish. Update June 6th, 2014: I've added The Murky River; as it's a prominent feature of Mirkwood in The One Ring, and I've move Woodmen Town further into the forest and south, as well as added Woodland Hall, so that the map now matches the game map better.